You may remember I got a beautiful LV Christmas gift, a classic monogram shawl I'd wanted for years. I had to wait until now and winter to wear it, but as soon as scarf weather arrived I was thrilled to take it out for a spin! It's coldest during my commutes to and from work as it's outside the heat of the day, so the cosy scarf kept me suitably warm. I wasn't too sure about how this outfit would all work together. I really wanted to try the navy peasant top with the pink pencil skirt, but I wasn't sure if the blue scarf would work with the navy. I'm so pleased I gave this a go though, the different shades of blue look great together. As an added bonus, the scarf helped hide the makeup spill I had on my top in the morning - I did try wash it off but makeup is stubborn and I didn't have a lot of time, so I appreciated being able to wrap up a bit and hide the evidence of me rishing about in the morning and being my usual clumsy self! The only downside is that it does cover the top up quite a bit in the outfit and makes it a little hard to see, but it's this one I recently bought from Jeanswest in one of their sales. Ended up having lunch with hubby in the city. I got a call on my way to lunch saying he'd been another office and was near my building so we had lunch together. Was a nice change to catch up without the kids in tow! 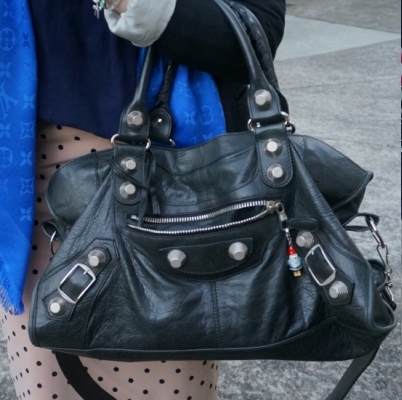 Last worn: black jersey blazer, navy peasant blouse, pink polka dot skirt, Walnut Melbourne ballet flats, Balenciaga Black Part Time bag. First time I've worn the Louis Vuitton shawl. 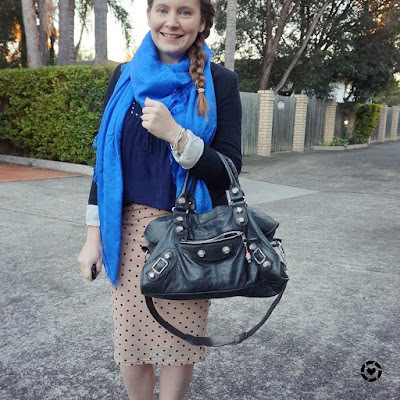 Other ways to wear: black jersey blazer and a-line skirt, navy peasant blouse worn two ways, pink polka dot skirt and black shirt, Walnut Melbourne ballet flats and blue dress, Balenciaga Black Part Time bag and pastel outfit. Perfect for pregnancy: black jersey blazer in third trimester, pink polka dot skirt in first trimester, Walnut Melbourne ballet flats in third trimester, Balenciaga Black Part Time bag in second trimester. In case you missed it, including the short and sweet reveal of this gorgeous scarf, including some ways to wear it and how large it is compared to my petite frame! Just like the outfit above, I'd been wanting to wear this top and skirt combination together. I recently unboxed all my winter things, this long sleeve teal henley is one of them. I thought the colour combination with the blue skirt was nice, but I did worry the top was a bit casual for the office. The blazer helped to dress is up a little, and I've mentioned previously how I really like this cream jersey blazer with the lace skirt, as they have similar colours. The cream blazer, tan flats and black Balenciaga bag were nice neutral options to wear with all of the colour in my outfit. 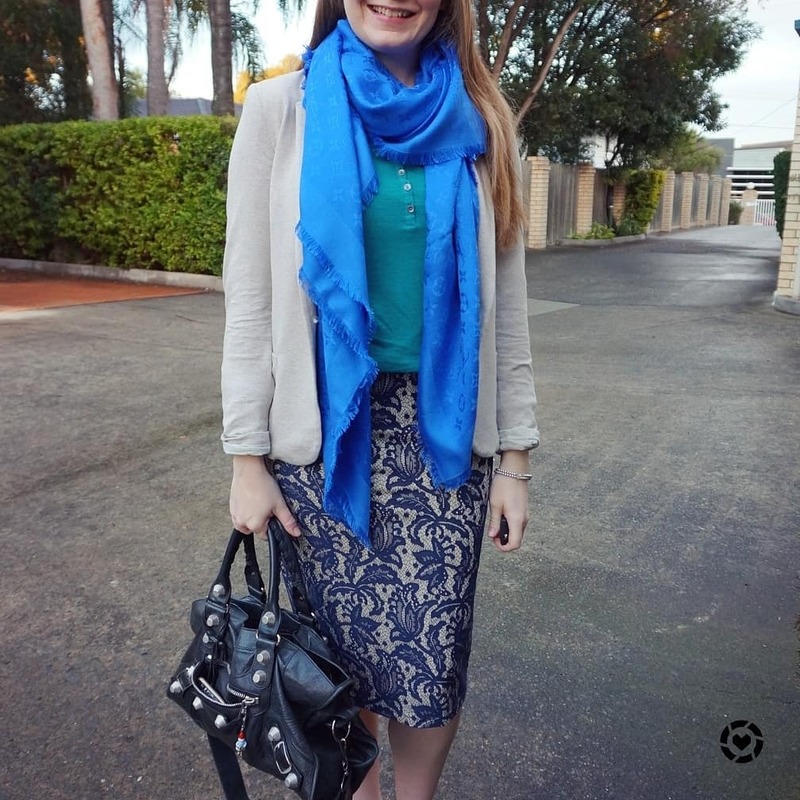 I've only recently started wearing green and blue together, and I loved the different shades of blue with the teal, from the lace pencil skirt and the blue monogram shawl. Once again, this scarf kept me cosy on the early morning commute. It's part wool, so perfect for wrapping up in on a cold winter morning. I might even have to get my tights out next! Last worn: cream jersey blazer, teal henley, Louis Vuitton bleu shawl (above), blue lace pencil skirt, camel flats, Balenciaga Part time bag (above). Other ways to wear: cream jersey blazer and Aztec print dress, teal henley and printed jeans, blue lace pencil skirt and wrap top, camel flats and printed dress, Balenciaga Part time bag and shorts. Perfect for pregnancy: cream jersey blazer in second trimester, teal henley in second trimester, blue lace pencil skirt in third trimester, camel flats in second trimester, Balenciaga Part time bag and maternity pencil skirt. You don't have to stick with a neutral colour pallette when putting together a work outfit. It's easy to wear a colourful pencil skirt and top together, and still perfect for a business causal office. A scarf, as well as being a winter essential, is another nice way to add some colour to your layers and is easily removed when you get to your desk, so you can be a litle more adventurous with a bold colour or print. Linking up with Trend Spin, Turning Heads, Fashion Frenzy, Style On The Daily. What a beautiful coloured shawl! I really like the polka dot skirt in the first pictures, so pretty! Happy New week Mica! I absolutely love the scarf. It is very luxe and layers softly. The colors in your outfit creates a beautiful blue ombre effect. I am headed to workout then join a summer reading challenge! I pray you are feeling better and you have a wonderful week. Thanks Tiff! It sounds like you had a wonderful day! That look is so classy! I love the blue scarf styled with the look. The skirt really dresses up the look, and the scarf balances it out by adding a casual vibe. I hope you have a wonderful week too gorgeous! I really like the navy top with the pink skirt, the blue of the scarf is a little too vibrant for my taste, but I never had a thing for bright blues. Probably because everyone tells me I should wear them with my blonde hair! 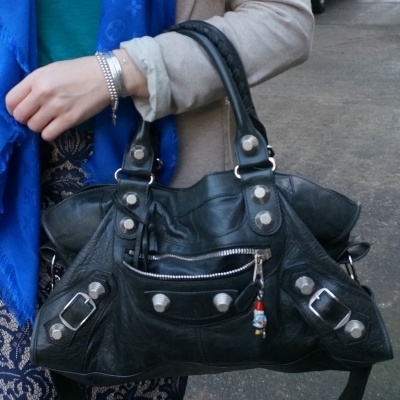 Cute outfit and love that handbag! You always have the cutest handbags. Oh that scarf is so pretty! Love the vibrant, beautiful blue. And both of your pencil skirts are great, too. I especially love the textured lace skirt. Hope your week is off to a good start now! I do think that this shade of blue works with more than we realize!! It's so lovely with both of these outfits, Mica!! Thanks Jodie! I am looking forward to wearing it with so many other colours! What a gorgeous scarf, and that color looks so good on you! And yay for it hiding a stain during a morning rush too, I have also grabbed a scarf to cover up a spill :) And how nice to have a kid-free lunch date with your hubby too! Yes, being a clumsy person myself, having a scarf is the best! They both like stylish, but office friendly outfits. I forgot about the shawl - it's such a gorgeous shade and I can imagine it will be worn quite a bit more! Yes I'm looking forward to getting more wear from this over this winter! Your outfit looks so good on you. I'm glad you are finally able to wear your beautiful scarf! It's such a gorgeous color and looks really nice paired with the outfits you have here! I can't wait to see how else you are able to wear it! Thanks Laura! I've been enjoying being able to wear it again! These are both lovely outfits for showing off the LV scarf - and that is a GORGEOUS colour on you! Yes, all shades of blue can work together, and same with blue/green. Way to go on pushing yourself outside your comfort zone! Oh, and if you ever make it to my part of the world, I will take time off work to hang out with you and show you around! You're on my list of "bloggers I would love to meet someday"! Thanks Sheila! I'm trying to be more adventurous with the way I wear pieces in my wardrobe :) I will definitely let you know if i'm ever in your area! It would be so fun! How lucky you are, this gift is awesome !! I really like the pencil skirts for the office. They are so elegant and perfect and don't show more than they should !!! I liked the second look most, you know I have a childhood trauma with the polka dots, any day I tell the story on the blog.- This also happens to me in a hurry to make-up myself I ended mess up my clothes, but its okay we don't you see anything!!! Finally summer came to Portugal oh yeah !!! Oh dear that sounds interesting with the polka dots! Belíssimo echarpe! Gosto muito de usar e tenho vários. 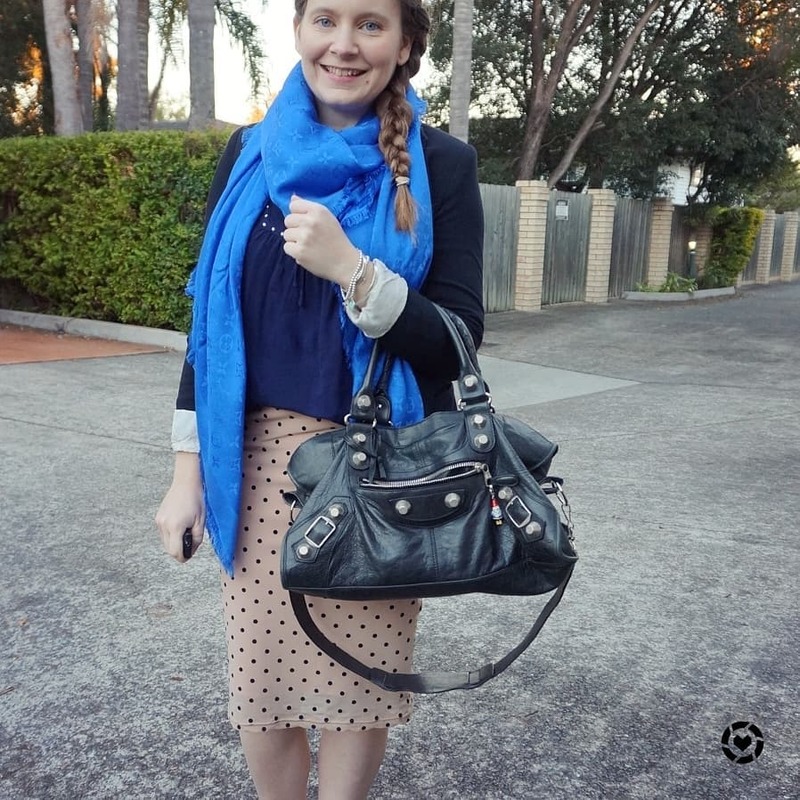 Love this cobalt blue scarf, so pretty! Bold colours make such a great statement and I love how you styled this cute look. I love these outfits! The blue is so pretty! I love your outfits! That blue scarf is stunning! It is awesome being able to catch up for lunch during the work day! :) Shame you can't do it any more! What a fabulous blue scarf. I've always loved this shade of royal blue. It's so vibrant and instantly would put anyone in a great mood. I'm very much a fan of scarves – my collection has been growing rapidly as of last year haha! I find that they are a great way to add a level of elegant and complexity to an outfit. It can also look very Parisian as well! I especially like this colour of blue on a dress with polka dots. I think that would be perfect for summer! Thanks Isabella, I'm a fan of scarves too! I'm enjoying the winter weather and the opportunity to layer! Yes the balance of neutrals and color are well done! 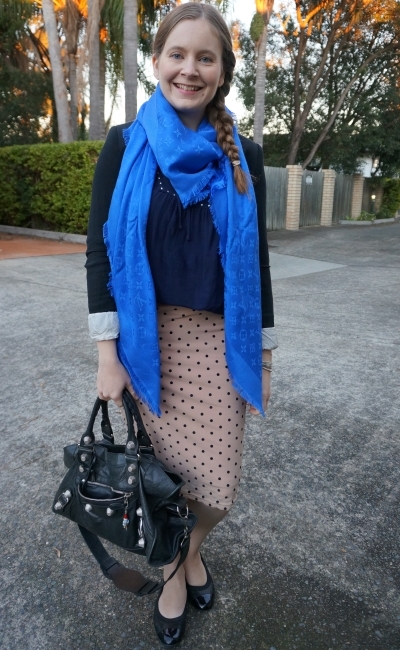 The color of that scarf is so fetching and love the lace and polkadot skirts, gorge! Your scarf is stunning. That’s awesome you had a lunch date with out the kiddos. We have yet to do a date day or night yet. Have a great week. Yes it's so hard getting time together! I love that things aligned and we both had lunch in the same place and same time, haha! Hope you get the opportunity soon! I have soooo much love for this Louis Vuitton scarf! The bold cobalt blue colour is stunning and really suits your complexion babe :) Hope your week has got off to a good start! Thanks Sasha! With our cold winter it's sure to get worn a lot more! Loving the pop of blue on you! Such a pretty and vibrant color, went really well with both outfits. Love this 2 cute office look! Those pencil skirts are so pretty and I love the fun prints! Both outfits are so chic. Like also the 2nd look, how good you started wearing green and blue together as I really like these colour combination! THanks Rena! It was great being able to catch up for lunch! That blue LV scarf is SUCH a pretty accessory- I love that color! What a gorgeous scarf! Such a special Christmas gift. The shade of blue is so striking, and I like it with both looks. You will get a lot of wear out of it. this strong blue-shade suits you perfectly. WOW, what a gorgeous shawl/scarf! I like the monogram too - it's not in-your-face but not too subtle either! Yes, it's a nice little print but not so bold that it will be hard to wear! Gorgeous, that sums up the scarf. Gorgeous also sums up how that color looks on you ! I can see you wear this endlessly. With dark blue it totally works and with green: ohh laaa laaa and can you imagine it with pink ?! Yes, I loved it with the pastel pink skirt, I'd really like to wear it with more pink! haha yes, early winter is quite mild here thankfully! That scarf looks absolutely beautiful; blue is your color! I've been wanting a scarf like that, too, but in the brown color. Such a classic, you'll wear it for years! Thanks for sharing and have a great rest of the week! I think it's definitely worth the splurge! Like you said, it's a classic! This is really a beautiful scarf. I love the bright blue, perfect for brightening up your fall/winter wardrobe. You look gorgeous in this shade! Very pretty scarf! I love the blue tones on you. It looks wonderful with your outfits, and the pink skirt. Of course I love your BBag and I which reminds me to start wearing my one and only pink one.